This week we shall be discussing about our very own 13th month pay and how to spend it wisely. Considering that it is already December, I bet you are all giddy and jolly in receiving this much coveted pay and bonus. As a matter of fact, we are always anticipating this and more so we are just excited to have it. However, since this only comes once a year, might as well be wise and be smart on how to spend it. Few days ago, I suggested one idea as to how to spend your 13th month pay. The suggestion was to pay your debt. Then the next one would be to invest it. 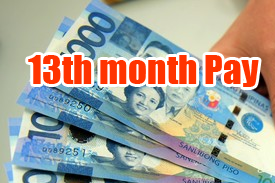 Today, perhaps you might want to invest your 13th month pay to yourself. I am not talking about buying those expensive gadgets and fashion items to boot. Well, that can be an investment but it is most definitely not a smart and a wise one. What I am referring with regards to investing in yourself would be not to improve your current pool of gadgets or wardrobe. But rather than improving your skills and your mindset. Considering that apart from getting bonuses this Christmas, you will also be getting a lot of free time too. There are many holidays so to say hence you will have all the time to develop some skills you would want to pursue. For instance, you can opt to learn baking, learn a new language, learn to paint, learn a new sport and more. There are many short term courses and even modules that you can enrol. Plus, there’s the Internet to help you get started. These personal skills are called intangible investments. True you may not put these items in your curriculum vitae but it can increase your personal net worth. Even more, you can be able to reap a lot of rewards from it. Since you have a new skill to show, you can expand your horizons and even your opportunities. For example, you used your bonus for a baking class in the holidays. Then you are in love with baking. By next year, you might try to get orders for your cookies or brownies. You can then sell these to your officemates or to your friends. That would be an added income on your end. What if the orders will keep on coming? Simply imagine how much you would be getting in the process. This will also hold true for the other skills you might want to know and familiarize yourself. Buying books is also an investment. For instance, if you have been itching to invest in the stock market, you might want to read some books and resources first. You can go to your nearest bookstore and acquire titles that would surely help you with your stock market investing skill. Then you can use your free time to read on those resources so that by 2015, you are pump up and ready. Learning a new skill and gaining new knowledge is one great investment. As what Robin S. Sharma said, the best investment is to invest in yourself. Hence, why not allocate a little percentage of your 13th month to pay. The things that you will learn would surely be valuable and priceless. P.P.S To those doing the 52 Week Money Challenge and 52 Week Money Challenge Version 2, it is Week 49 already! Did you deposit the next amount yet?